A very interesting piece that features an oval cut, natural Sapphire that is set in 14kt White Gold with a generous amount of Diamonds. The Sapphire is a nice, rich blue color that really compliments the vibrant white Diamonds. 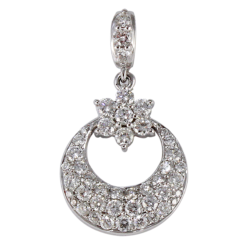 The Diamonds are arranged in a floral-like design with the Sapphire in the center.